Groups demand immediate action, amid concern that imminent collapse of government will push off evacuation of illegal outpost indefinitely. Last night, Wednesday, a coalition of leading pro-Israel groups in Israel held a joint press conference in which they called on Prime Minister Netanyahu to proceed with the dismantling of the illegal outpost Khan al-Ahmar. The press conference was simultaneously broadcasted live to the over one million social media followers of the organizations, which included Im Tirtzu, Regavim, My Israel, Women in Green, and many others. According to the organizations, their demand comes in light of the concern that the government will soon disband and the evacuation of the outpost will be postponed indefinitely. "A strategic point in the State of Israel has been, for all intents and purposes, seized," stated Im Tirtzu CEO Matan Peleg who opened the press conference. "This land seizure occurred in broad daylight, without the use of weapons – rather, it was done via political tools of the Palestinian Authority and European governments. "Khan al-Ahmar is a case study," continued Peleg, "and if we fail because our eyes are focused squarely up north on Iran and Hezbollah, then other hostile political maneuvers like this will occur against the State of Israel under our very noses." 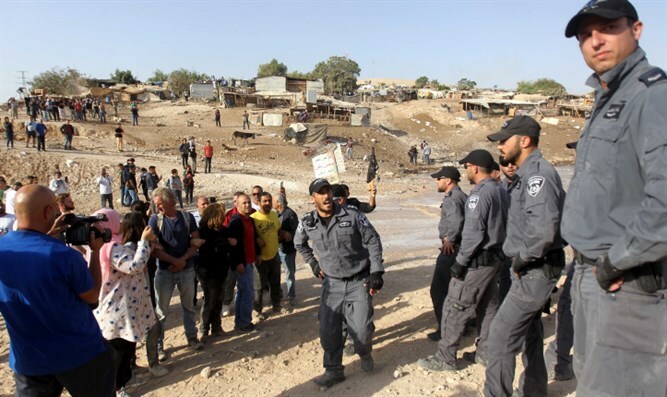 Yishai Hemo, Field Coordinator for Judea and Samaria for Regavim that has been leading the legal battle against the illegal outpost, stated that "Khan al-Ahmar is the cornerstone for the establishment of a Palestinian state on the doorstep of Jerusalem." "And it is for this reason," continued Hemo, "why the Palestinian Authority and the European Union pour enormous sums of money into defending it." Attorney Eran Ben-Ari, an expert on law of Judea and Samaria who spoke at the press conference, said that Khan al-Ahmar is a watershed decision in upholding the rule of law. "The state promised the Supreme Court that it will evacuate the outpost in June 2018, and for already six months it has been in breach of its own commitment. The damage caused by the prolongation of this situation vis-à-vis the court and the Palestinian Authority, will be irreversible," said Ben-Ari. Gil Bacher, head of the Jerusalem Envelope Forum, added: "For already ten years the government has been promising to dismantle Khan al-Ahmar, only to retreat due to international pressure. Now, the danger is that this 'evacuation' will legalize this pirate outpost by making a cosmetic makeover and moving it only meters away."